During his visit in Natal yesterday, FIFA secretary general Jérôme Valcke inspected Arena das Dunas. The stadium that saw 10,000 people during its May 4 test is still far from ready. Especially the temporary seating sections at both ends need to be set up. The stadium’s original capacity is below the 32,000-seat mark to ensure the ‘white elephant’ effect wouldn’t happen in legacy use. But this means over 8,000 temporary seats needed to be set up in an effort to meet FIFA’s group game minimum of 40,000 net capacity. To this day only one is fully delivered and the other needs seats to be installed after the tubular skeleton is ready. "Race against the clock. Still lots to be done for World Cup fans and media," Valcke wrote on Twitter after visiting the host stadium in the city, posting a picture showing long rows of skeletal stands waiting to have seats installed. "We need full commitment from all parties in Natal to ensure all will be in place & tested prior to #MEXCMR on 13/06," when the Dunas Arena will host its first match between Mexico and Cameroon. 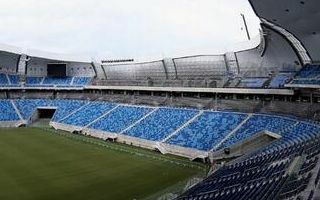 The extremely late delivery of temporary seating comes as a surprise, because Arena das Dunas was opened on January 26.